5.69 points at 13 votes (rank 697). Oh, what a beautiful motif! 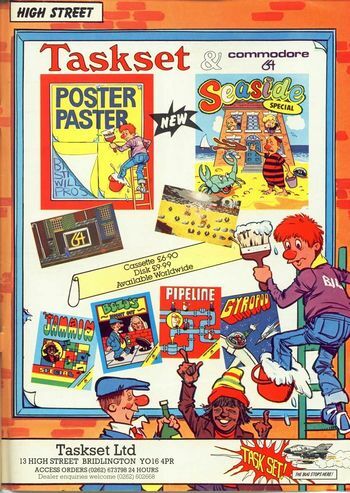 Poster Paster is an arcade game by Taskset from 1984. In the role of a laborious paster Bill Stickers the player tries in 12 images to paste poster advertisement to billboards under more and more difficult conditions. At the same time he is hindered by aggressive gnomes (halluncinations from breathing the vapours from the dissolver??). "Gnurds", "Wazzocks" and "Brain Drains" try to get him with meanier and meanier methods and don't stop until the hero finally buys the farm or better the pasting brush. Bill starts with up to eight lives, there are no extra lives. Next to an advertisement for the best home computer of all times the most expensive paper weight in the world, there is also product placement for other titles by Taskset as Jammin or Super Pipeline. What especially catches the eye, is the multi-coloured design of the background: the facades and alleys of the surrounding kept in dark blue, froggy green and a glaring red are displayed in am implied 3d perspective without actually making it able to see the depth of the picture. The enemy sprites are kept simple and unicoloured. With an options menu you can choose the number of players, the number of lives and the difficulty grade before the start of the game and set whether you want to play with or without music. Especially the last point is important for keeping the mental health of the player. Although the game has - as the other titles by Taskset - a happy and catchy short tune with ear worm character, they start to lose their being welcome after a short time. Even worse: After it has digged its way into your subconsciousness, there is the peril that you will start to build it into your daily life by humming or whistling it. The game has a highscore table, but unfortunately, it is not saved. 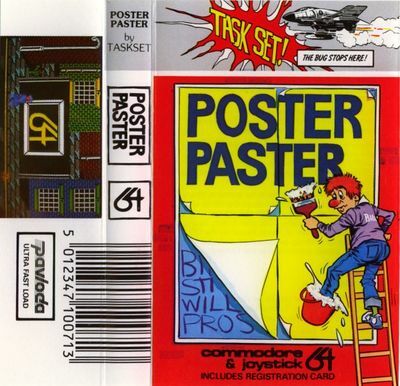 To paste a complete poster, Bill needs to pick the single rolls one after the other from the box, position the ladder at the right place, climb it up and then paste the poster onto the board. If the part was placed correctly, it will stick, if not it will roll down again and 1.000 points will be subtracted from the PosterPaster-Bonus (PPB) of the corresponding screen. 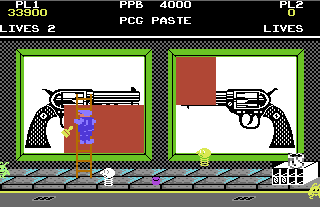 In later levels there is an additional flashing square on the street, with which you can change the size of the ladder by touching it. Bill can shoot paste with his brush to fend off the naughty gnomes, however, with shooting the paste gets more and more pasty and it finally dries out completely, whereupon you cannot shoot anymore. The only help here is the small clown in the shape of a watering can, which is as deadly as the other enemies, but it can thin down the paste, if you let him reach the bucket. solid (Bill cannot shot anymore), thick, lumpy, paste, gooey, runny and water (posters do not stick anymore). To pick up the ladder you need to put Bill below the ladder and press for a moment, Bill now carries the ladder and can put it down again by . align poster, then to stick down. The options menu is called up by pressing any key . The entry into the highscore list is done without pressing the fire button, or else a new game will be started immediately. The difficulty grade gets more and more perky, because in the duell of the paster masters the loser will kick the bucket. Posters can only get pasted if you are on the ladder and Bill must not shake or the poster will not stick. In the fifth screen it can happen that the poster rolls are mixed up by the walking hands. In the sixth screen Bill has to finish the poster before his competitor does or he will lose a life. In the seventh screen water is poured onto the billboard and you need to wait for it to dry, so the posters can stick again. In the eighth screen a cheeky gnome constantly switches the ladder to short. This leads to the loss of a life, if Bill is currently on the ladder. In the ninths screen there are sink traps in the street from which an arm comes up and pushes the ladder to the back. It happens, no matter if Bill is on the ladder or not. Of course touching the arm is deadly. The version by Androcles has trainer options. Robotron2084: "Poster Paster is in a sense a likeable game, which for its time looks good and has a really inventive idea. If it only wasn’t for the fiddly controls and the slightly monotonous course of the game, it could have what it takes to be a classic. This way this paste-saga is at least for me a technically convincing, but exhausting and later unfair skill test with after some time really unnerving (!!!) music which I at most want to play out of nostalgia. My GameBase frontend tells me that the last time I played this game was in 2009 – this can only mean one thing: that my enthusiasm for this game is quite limited: 5 out of 10 points." 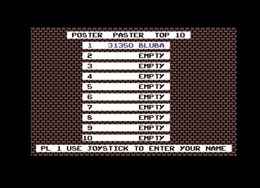 Blubarju: "Poster Paster is always good for a short round. The graphics are rather successful, soundFX and music on the other hand are so-so. The only real point of criticism is the controls. Robotron is quite right there! Therefore only 7 points from me." Poster Paster in demonstration mode. 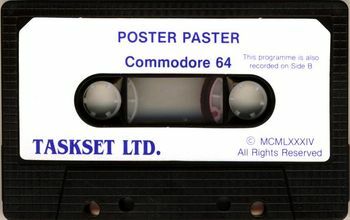 Cover of the cassette version. Combined advertisement for amongst others Poster Paster, Jammin, Super Pipeline and Bozo's Night Out. Difficulty level: "normal" with three lives. This page was last modified on 5 March 2016, at 17:10.